When the Edmonton Oilers made the playoffs for the first time in 11 years, people took notice. The young team had arrived. They finally made it. It only took head coach Todd McLellan two seasons to accomplish the feat and the age of Connor McDavid had arrived. And so on. But all the hype will come to an end when the puck drops on Wednesday night and the Oilers get a good look at the San Jose Sharks. The two teams met in 2006 and Edmonton won, but these Sharks are dangerous, grizzled and ready. 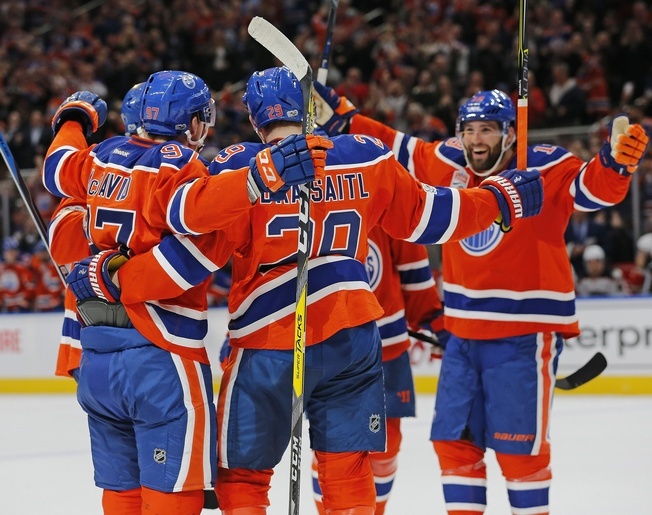 They’d like nothing more than to put an end to the Oilers’ fairy tale. Edmonton went 47-26-9 in the regular season, a 33-point improvement from last year, and they slipped into second place in the Pacific Division. The Sharks went 46-29-7 and are looking for a measure of revenge after making it all the way to the Stanley Cup Final last season. Unfortunately, San Jose is dogged by injuries right now. Both Logan Couture and Joe Thornton are uncertain for Game One. Experience is not part of the Oilers’ game, but who cares? Connor McDavid has been playing astonishing hockey and he’ll have a chance to shine in the playoffs. He hit the 100-point mark in the regular season, with 30 goals and 70 assists, and he’s on the ice for over 21 minutes a game. He’ll have all the coverage, so he’ll have to prove he can get out of a jam. Leon Draisaitl will also be looking to make a splash. The German winger had 77 points this season, including 29 goals. He plays 18:53 a game and likes to dish the biscuit. He can score and plays at a high level. He’ll benefit from all that McDavid coverage, but discipline can be an issue. Milan Lucic is the kind of player to blow a game wide open with a crushing hit. He’ll be called on to tough it out with the larger Sharks team. He has the experience to do so, plus he can actually put the puck in the net. Lucic had 23 goals last season for a total of 50 points in 82 games. Jordan Eberle is part of the equation. He had 51 games in the regular season and piled up 20 goals. Eberle can play setup man or pop in his own offence, plus he never takes a shift off. Ryan Nugent-Hopkins fields a quality two-way game and came up with 43 points in the regular season. Injuries to Thornton and Couture will prove problematic for the Sharks, but there are pieces to work with. Joe Pavelski is at the top of the list, with 68 points in the regular season. He averages 19:07 of ice time a game and can play any role. He’s good on the draw and can boost his team’s possession numbers. And make no mistake about it, the Sharks will play possession hockey. They’ll hog the puck and dish it to the likes of Patrick Marleau. The 18-year veteran scored 27 goals in the regular season and still has the speed to cruise past the defence. He’s also a natural scorer, even if inconsistency has troubled him in the playoffs. If Couture does return, the Sharks will get another top-shelf talent. And as of now, he’s stated a desire to play and was on the charter flight to Edmonton. Make of that what you will. He’ll wear a cage if he does play and one has to imagine he’ll be missing a few steps, but he’ll also be hungry. And Thornton is also listed as day-to-day. The veteran had 50 points this season and is still one of the best passers in the game, plus he sees the ice like a dream and plays over 18 minutes a game. He’s big, tough and has a long reach. Most of the chatter in Edmonton relates to the team’s knack for goal-scoring, but Oscar Klefbom has something to say about that. The Swedish defenceman had a dozen goals in 82 games and averaged 22:22 of ice time a game. He plays a shutdown style, plus he knows where he is and has good wheels. The newly-acquired Adam Larsson is a composed defenceman who can blast the puck from the point on the power play. He had four goals in 79 games and averaged 20:08 of ice time a game. The former Devil plays a shutdown game, but physicality can be an issue. Kris Russell likes to block shots and muck it up. He averages 21:13 of ice time a game and had 13 points in the regular season. He can work a second unit on the power play and is fast on the puck, even if he’s a touch on the small side. Veteran Andrej Sekera will also put in work. He averages 21:28 of ice time a game and scored eight goals. The Sharks have another forward on the back end with Brent Burns. The hirsute wonder scored 29 goals and added 47 assists for a total of 76 points in the regular season, with eight goals on the power play. He can skate and hit, plus he can be used as a winger in a pinch. Marc-Edouard Vlasic had 28 points in 75 games, averaging 21:14 a game. When Burns rushes, Vlasic stays put. He makes few mistakes and plays a mature, seasoned game. He’ll play in any situation and brings accountability to the Sharks’ defensive core. Veteran Paul Martin works in the same vein. He’s mobile and plays big minutes, with an average of 19:13 down the stretch. The former Devil keeps it simple. He’ll make few mistakes, even if he takes few chances. And David Schlemko is a new arrival worth mentioning. He could see an increase in ice time and can play the left or right side. Cam Talbot has played like a man possessed. He’s given them a chance to win every game, which accounts to why and how Edmonton has played such wide-open hockey. Talbot went 42-22-8 in the regular season, with a .919 save percentage and a 2.39 save percentage. He also posted seven shutouts. With Jonas Gustavsson in the AHL scoring goals, Laurent Brossoit will pull the job as backup. The Port Alberni native was 4-1-0 in the regular season, with a goals against average of 1.99 and a save percentage of .928. He competes every night, but if he’s thrown in the fire against the Sharks he’ll be in for a ride. Martin Jones is the man for the Sharks. The North Vancouver native went 35-23-6, with a 2.40 goals against average and a .912 save percentage. Jones covers a lot of the net and doesn’t look like he’s doing a lot in the crease – even when he makes some blockbuster saves. Backup Aaron Dell, the team’s Bill Masterton Memorial Trophy candidate, has taken an unusual road to the NHL and has to be one of the hardest working goalies in the league. He went 11-6-1 in the regular season, with a 2.00 goals against average and a .931 save percentage. This series could go the distance, particularly if the Sharks wear out the Oilers. Conventional wisdom suggests they’ll play a more physical game and could rattle McDavid and Co., which could reveal weaknesses in the young Edmonton club. On the other hand, McDavid has a propensity to work through tight coverage and the Oilers can overpower the opposition with goals and shots on target. Edmonton also has the goaltending edge. My call: Edmonton in seven.